SPECTRE. Bond 24: Connecting the ‘deads’. With the opening shot of the film, a seemingly one take tracking shot which lasts for several minutes, director Sam Mendes immediately leaves his calling card. In Mexico City amidst the Day of the Dead festivities James Bond accompanied by a woman (no surprise there) follows a man in the partying crowd. When the man enters a building Bond and the woman enter the hotel next door, take the elevator and enter a room and to her surprise instead of making love to her he immediately exits the room via the balcony, casually walks across the rooftop untill he can look into a window of the opposite building where the mystery man he was following re-appears. End of the opening shot. The entire film is directed with a lot of class and respect for the older Bond films and continously has -at times- rather subtle nods to the entire series. A lot of scenes and circumstances hint at the pre-Daniel Craig Bond films. The main henchman looks like a mash-up of Oddjob and Jack Palance. When you see Ernst Stavro Blofeld you expect to see a cat and low and behold … . Before the opening shot of the film -as discribed earlier- really gets going the statement ‘The dead are alive’ appears. When you look at the typical highly stylised James Bond opening credit sequence you may briefly spot certain characters that died during the 3 previous Craig Bond films o.a. Vesper, Silva, Le Chiffre and M. The story of the film itself revolves around the criminal organisation SPECTRE (Special Executive for Counter-intelligence, Terrorism, Revenge and Extortion) which might have been active throughout the Craig reboot Bond series without us really knowing about it. Bond is on a rogue mission -as was Ethan Hunt in episode 5 of the M:I series called Rogue Nation- to hunt down the head of the SPECTRE organisation, and as was the case for the M:I agents the 00 agents are also under threat of being closed down. Modern technology makes blunt tools like the 00 agents obsolete according to a new boss in the UK’s Secret Services world called C.
All the elements you wish (or expect) to see in a Bond film are present, beautiful Bond girls (Léa Seydoux and Monica Bellucci), Miss Moneypenny, Q, a spectacular Bond car (The Aston Martin DB10), a lot of breathtaking stunts and a larger than life villain played by Christoph Waltz. Waltz is getting one of those old fashioned star entrances: a character everybody is talking about and who’s being feared but it just takes a long time before we actually really get the see him. We first get to see his head from behind during a funeral. In a next scene we get to see his silouette, his face remains in the dark before a sudden turn lights-up half of his face. One of those delightful Sam Mendes directorial touches that give his Bond films (he also directed ‘Skyfall’) that little extra. < Previous Ex Machina. Artificial Intelligence put to the test. Next > The Green Inferno. Eli Roth’s ‘Cannibal Holocaust’ homage. Afraid to read. Spoiler alert? I never spoil the plot. Go ahead and read. maar is em nu goe of nie? 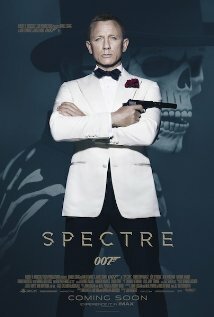 Toch wel, Bond is Bond dus je weet waar je aan de verwachten maar de film is echt wel knap geregisseerd en meer hoeft dat voor mij soms niet te zijn.